The area brims with activity since early morning. One of the places I visit for a quick breakfast is Gobinda’s stall. It is just at the start of Kakulia Road next to Mouchak. At around 8:30 in the morning you can find a motley crowd enjoying his Karaishutir Kochuri. 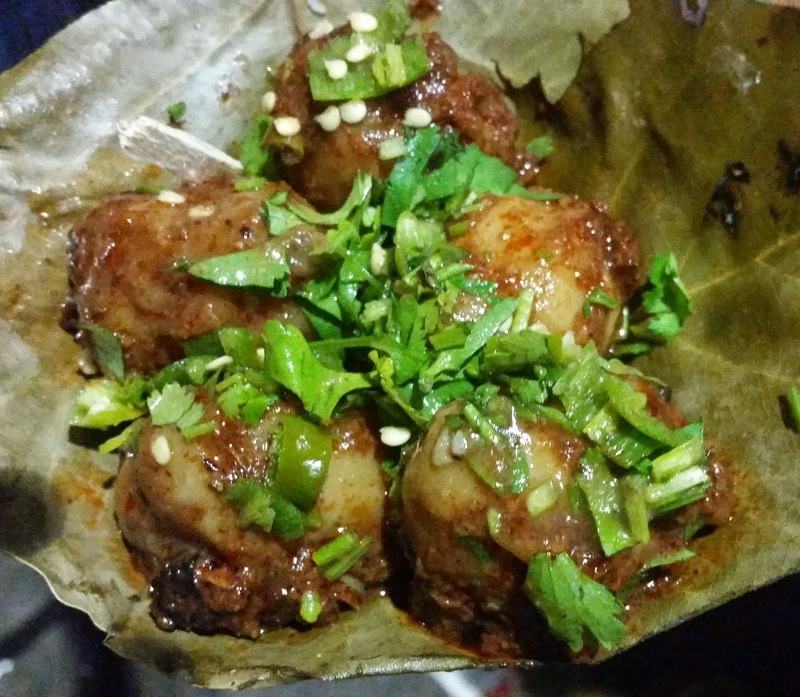 Gobinda serves his kachuris with an option of Chholar Daal or Alur Dom along with a side of pickled chilis. 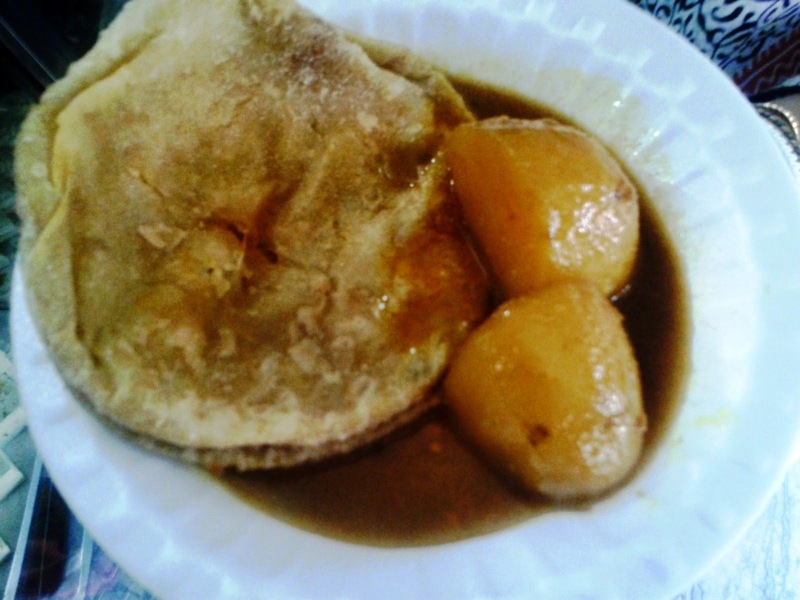 Two kachuris with the sides cost a mere Rs 12. 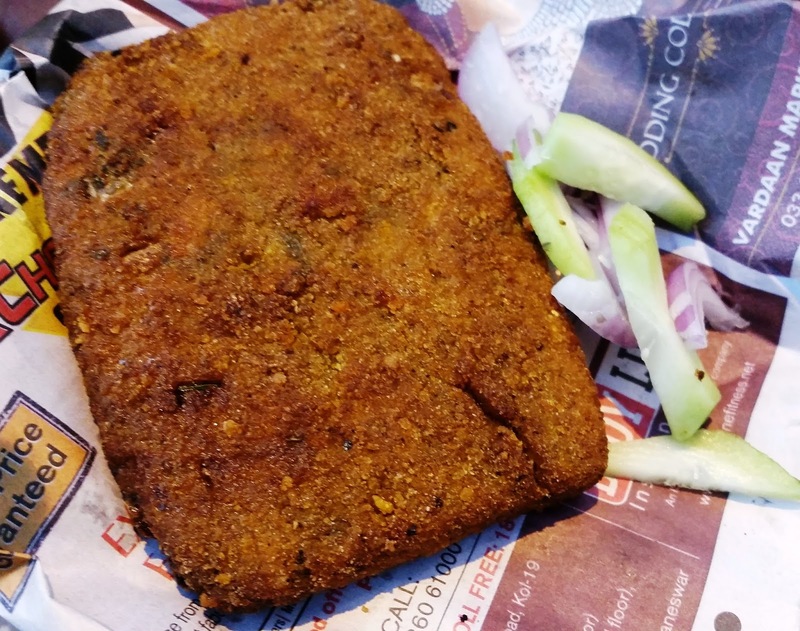 In the evening Gobinda dishes out some mean Chicken Cutlet, Fish Fry and Dimer Devil from the same place. 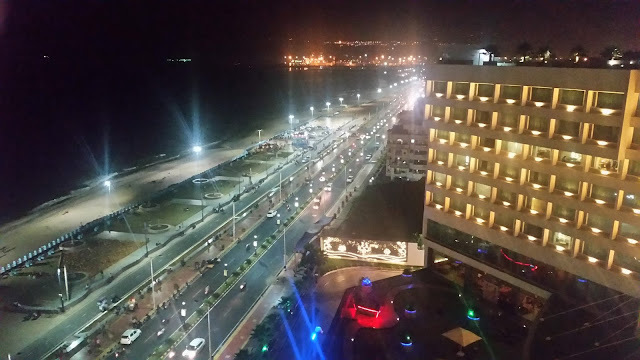 Fish Fry here costs around Rs 35. Another place to savour great breakfast is the famed Ganguram, just across the road. 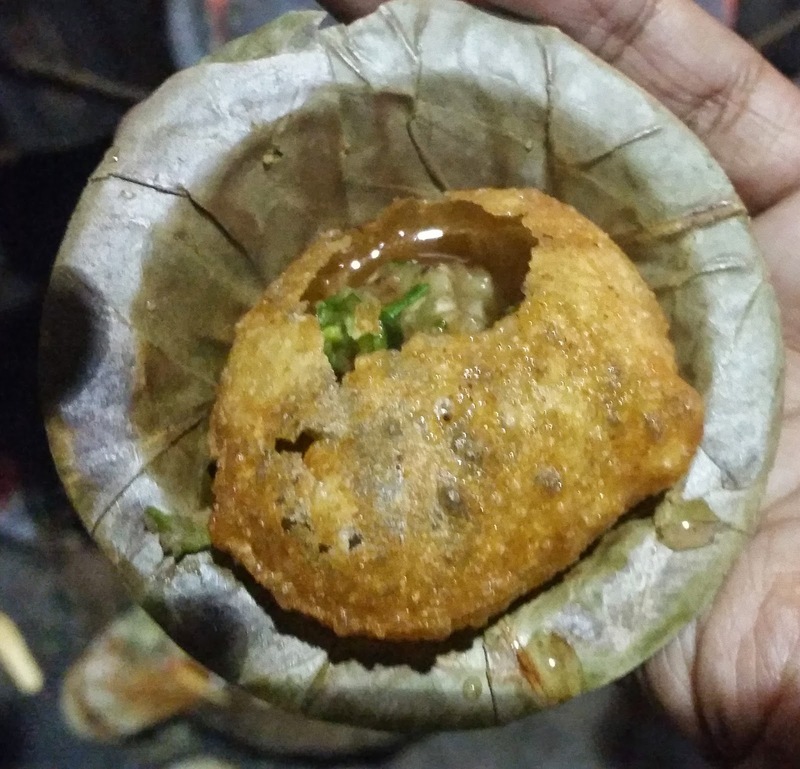 Their Radhaballavi (Rs 12 each) served with Alur Dam is simply mouth watering, though a trifle oily. You can also add a small portion of their Mishti Doi to end your breakfast. As the day progresses other street food joints in the area start operating in the area. 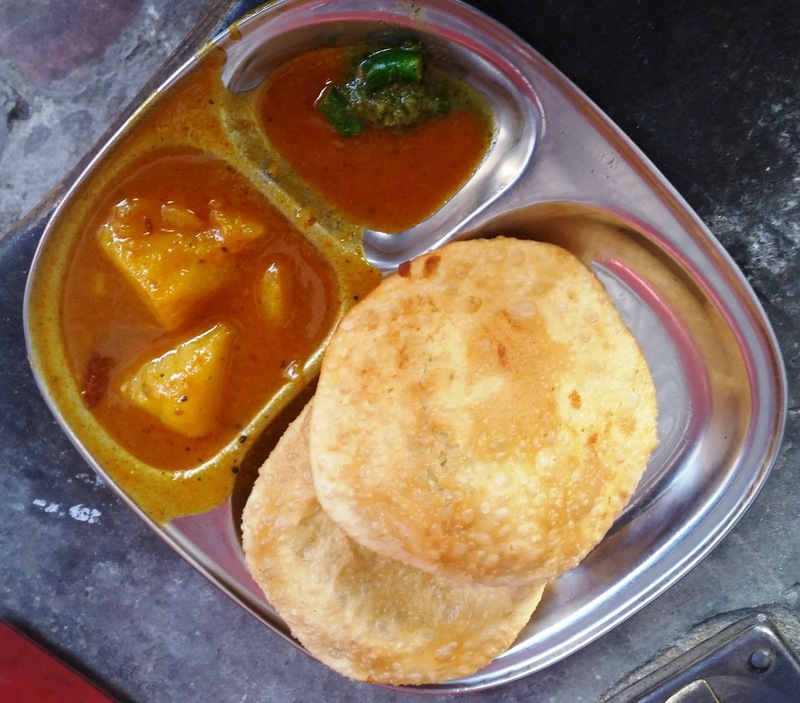 Dal Bora is one of the cheapest and favorite snacks for a passer-by wishing to munch something on his way. One place where you get fresh and crunchy Dal Bora is just down Kakulia Road. About 8 small pieces are available at a paltry Rs 5. The place also makes good Lankar Bora and Alur Bora too. 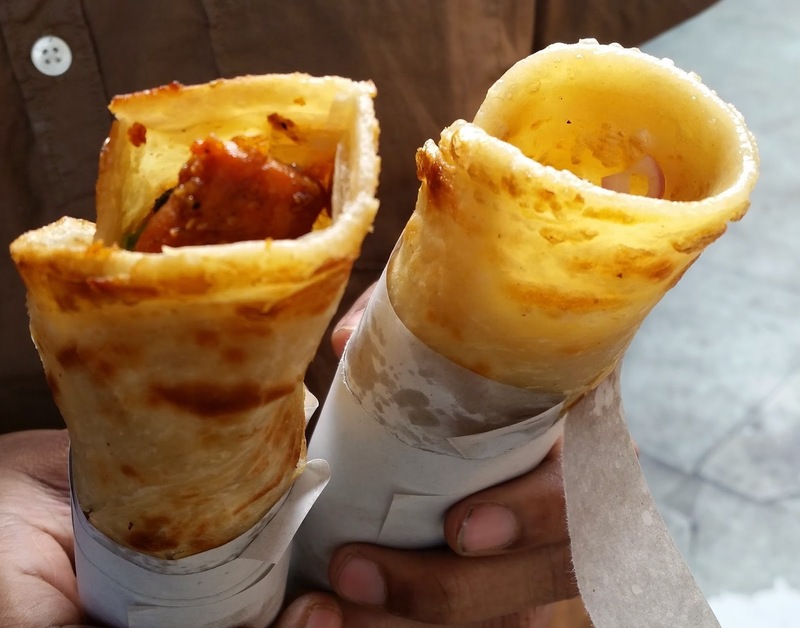 Gol Park also has Bedwin – known for their kathi rolls. 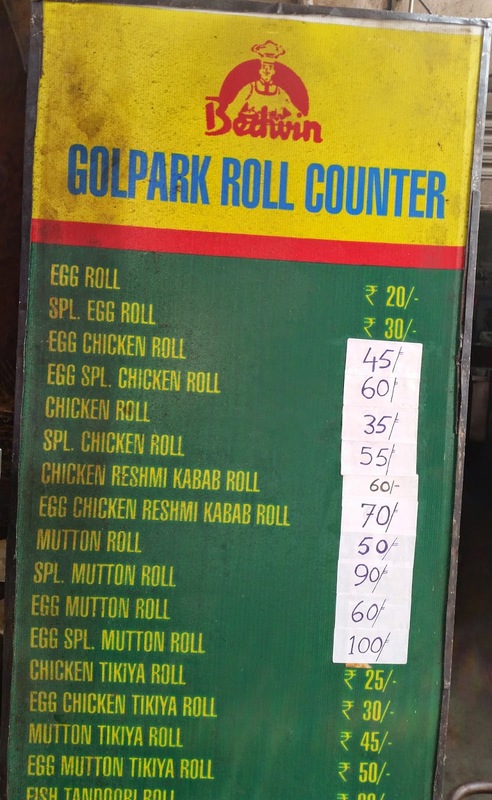 The roll counter is just outside their restaurant. It is a treat watching how carefully they prepare their rolls. My particular favorite here is the Special Chicken Roll, where double the amount of chicken is put. 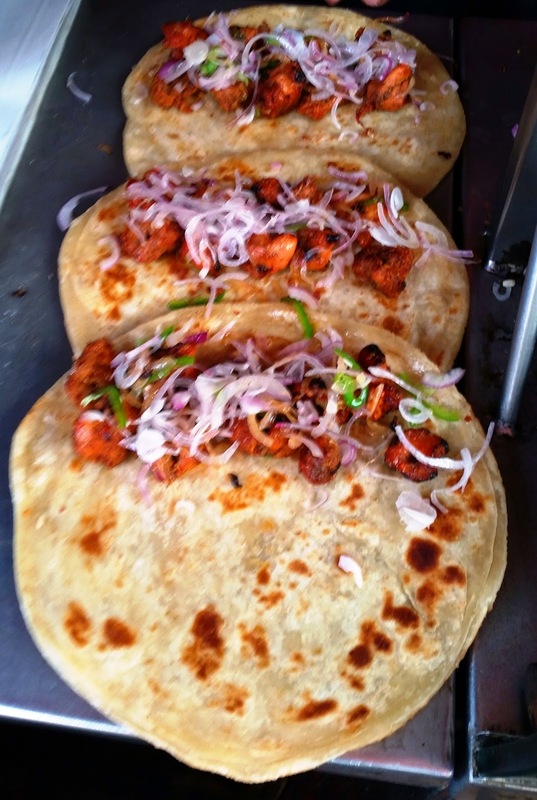 Thankfully the place does not use any sauces and relies on lemon, green chilies and their own spices which are added to the chicken, onions and capsicum to prepare the filling. They have some variations like Tikiya Roll and Reshmi Kabab Roll but I prefer to stick to the traditional recipe. For trying out the snack items like chops and cutlets, there is no better place in Gol Park than the branch of Mitra Café. 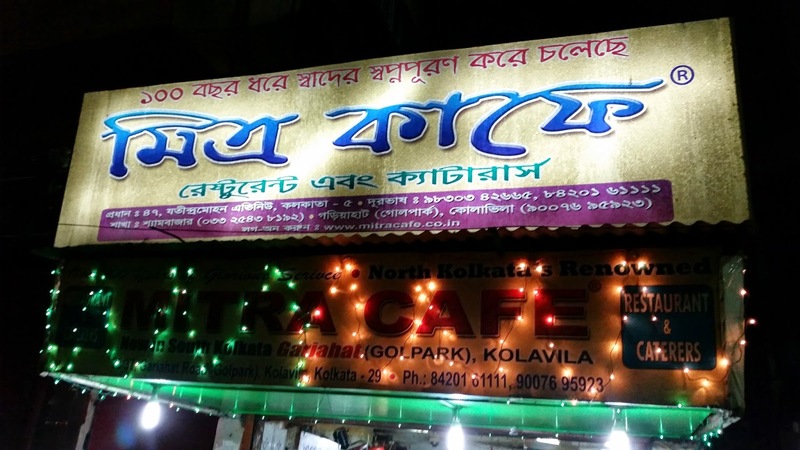 Mitra Café, the iconic eatery from North Kolkata is known for its Brain Chop, Egg Devil and Kabiraji Cutlets. The small branch which is on the main road close to Kola Villa makes some delicious fare but most of it gets over by early evening. 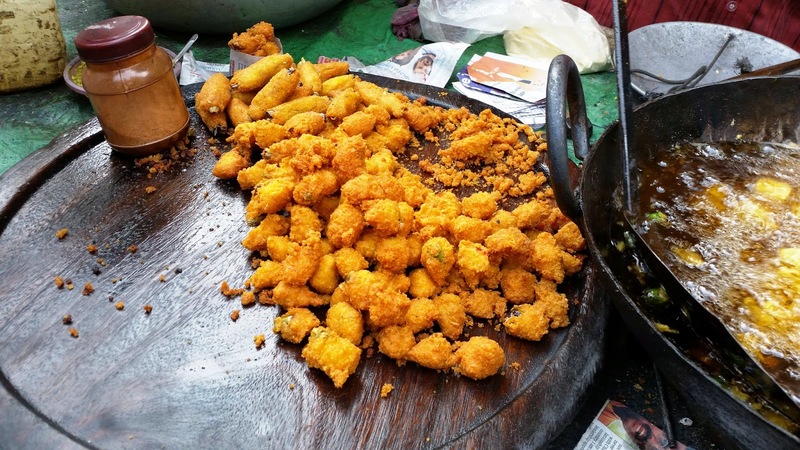 My favorite here is the Diamond Fish Kabiraji – a diamond shaped large fish fry covered with fluffy egg batter while frying. Brain Chop, which is a legendary offering of Mitra Café is however rarely available here. The last favorite of mine is the friendly neighborhood fuchkawala. Shaw, who plies his fare on the main road just across Mitra Café, hails from Hajipur in Bihar. His slightly sweetish Alur Dom with green chili and coriander sprinkled on top is simply not to be missed. The fuchka here also has a different recipe, with potatoes, chick peas and coriander. 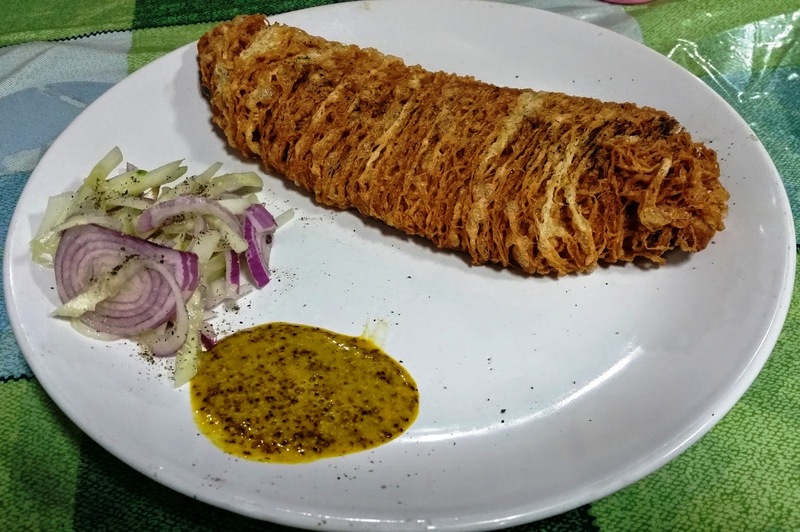 Apart from the above, there are many many other places we can talk about – the singaras opposite Aminia, fish roll in the small counter next to Ganguram, Das Cabin which is a few steps away at Gariahat and many more. We will talk about that on another day.